An officially licensed SQUARE ENIX FINAL FANTASY game for your phone, FINAL FANTASY AWAKENING features high-speed, action-packed ARPG online gameplay. Get ready to enter the world of Orience, the same universe of previous hits like FINAL FANTASY TYPE-0 and FINAL FANTASY AGITO, chose your favorite class and explore the world. A browser-based MMORPG which is based entirely on the popular Naruto Anime, situated in the universe of the series and following its storyline. It’s a Naruto web game directly licensed by Bandai Namco Entertain-ment and awarded THE BEST WEB GAME by Facebook. Steel Circus is the solar system's largest sporting event. Players control one of several champions with unique abilities in competitive online matches. Throw, pass, tackle and dodge to score goals in a game where skill, team play, and tactical decision-making pave the road to victory! Register for its upcoming Closed Alpha Test by clicking "SIGN UP" below. Animal Force is a colorful, casual VR game for PS4. Play through 7 chapters and 38 levels with 11 adorable animal heroes and defeat alien robot enemies plotting to take over the earth. Suitable for all ages with fun multi-player modes, this is the perfect game for all your parties and gatherings! Salary Man Escape is an edgy, satirical VR physics puzzle game where the player must use skill and tact to help a disgruntled Salaryman escape his life. Through clever interaction and manipulation of blocks and platforms, players must reorganize an edifice of bricks in order to create a route for the Salaryman to reach the exit. 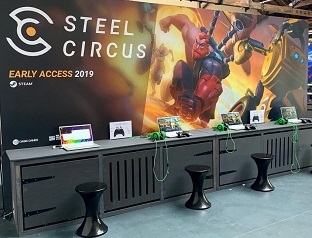 Upcoming competitive hero sports game Steel Circus made an appearance at two game conventions GDC and EGX Rezzed 2019 over the course of the past month. 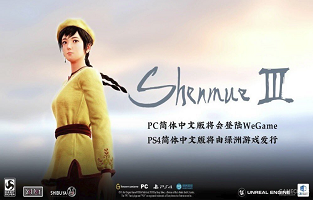 The Chinese version of Shenmue 3 for PlayStation 4 version will be published by Oasis Games, while its PC version will launch on the WeGame platform. 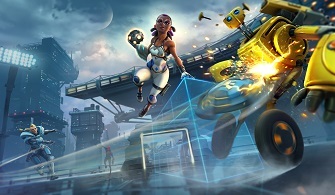 Steel Circus, a futuristic multiplayer hero sports game developed by Iron Mountain Interactive and published by Oasis Games, will begin its Closed Alpha Test via Steam in the next few months.